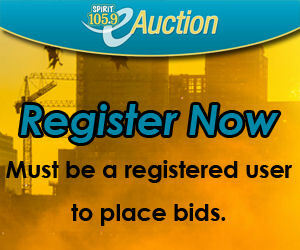 This auction will feature excellent deals that you won't want to miss out on. Upon auction closing, you will have until 11:59pm to submit payment using a valid credit or debit card. In the event that you do not submit payment within this time frame, you authorize NeoFill to process payment using the validated credit card you entered to authorize bidding. If you have any questions, please check our FAQs or contact our service dept. toll free at 866-311-9806. You may contact SPIRIT 105.9 directly at [email protected] or call 512.329.4420. Payment is made online at this website with your credit card. Your payment is to Neofill, which is responsible for collecting payments on winning bids on behalf of Spirit and the companies sponsoring the auction items. Neofill is a national company partnering with radio stations, TV stations and newspapers around the country. Neofill uses SSL (secure socket layer) to protect all customer purchases and does not store any credit card information in their systems. Your payment is due after the close of the auction. As soon as your payment has been processed you will receive a certificate by mail to redeem at the business sponsoring the auction item. CRISTA Media and/or Neofill undertakes no liability or responsibility, and makes no warranties, express or implied, with respect to the performance of the items being auctioned, for any failure to perform or negligent performance of any service provider, or for any other risk, incident or damage, direct or indirect, relating to or arising out of the auction, including (but not limited to) cancellations, postponements, delays or other scheduling changes; missed events or connections or inability of winning bidder to attend or claim item; and accident, injury, death, damage or expense arising from or occurring during the use of the auction item, or travel to/from or attendance at any event relating to the auction or the item, by the winning bidder and his/her guest(s). All bids are voluntary and in the sole discretion of the bidder. Accounts may be suspended if there is a violation of our e-auction rules and policies. If your account is suspended we’ll notify you by e-mail with instruction of how to reinstate your account. Specified vouchers will be sent in place of actual item. Voucher may be redeemed for item at physical store location. Items may be picked up at participating merchants or station with voucher as proof of receipt. Vouchers will state whether to go to the merchant or pickup at the station.